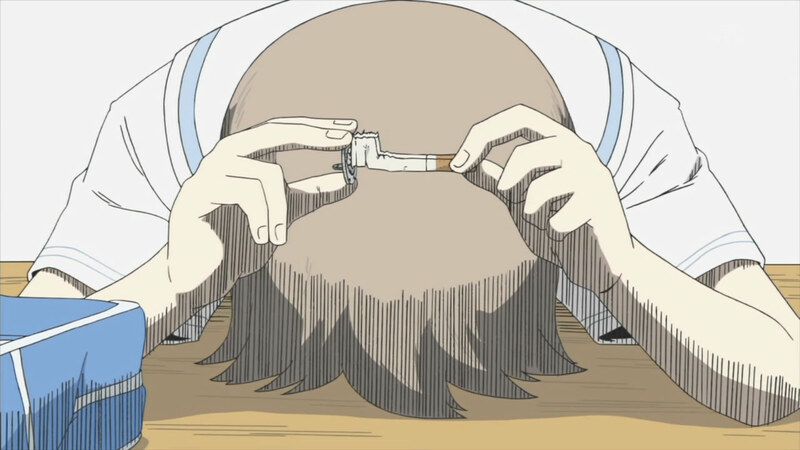 In the middle of watching A Channel, Rho sauntered over and wanted to see Nichijou. Ergo, here's the post on ep13. How can I say no to her? It has nothing to do with how slow and difficult A Channel is. The scene before the opening set up the stage for the episode's central theme. 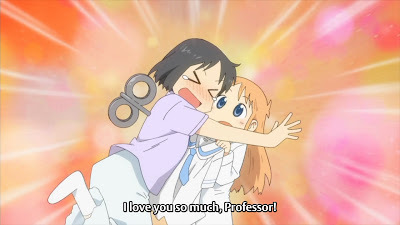 After falling for one of Professor's traps in the worst possible way (by literally getting the stick), Sakamoto noticed Nano eyeing the schoolgirls walking passed their front gate and brought up the thought to Professor that she probably wanted to go to school. Strangely like me every time a new concept is introduced, Professor freaked out and was immediately against the idea. 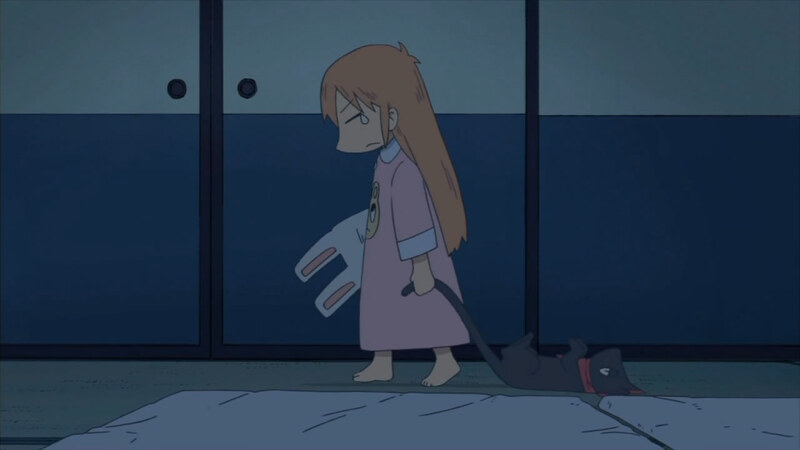 She wouldn't even let Nano go to the market alone (of course, that was probably aided by her desire for snacks). In the meantime, Yukko showed up to class with a fever so severe that she was swaying while standing and had a strange way of speaking. Her motivation was that she wanted to show Mio the magic tricks that she had been talking about. More than some special magic, the scene was absolutely hilarious because of Mio freaking out that all the magic tricks were getting sabotaged. The dove, which was clearly visible with its head sticking out of Yukko's bag, flew away and the wand that hid flowers in it dropped out. Mio was driven to tears and, I must say, it was really touching how hard she tried to salvage the magic act. 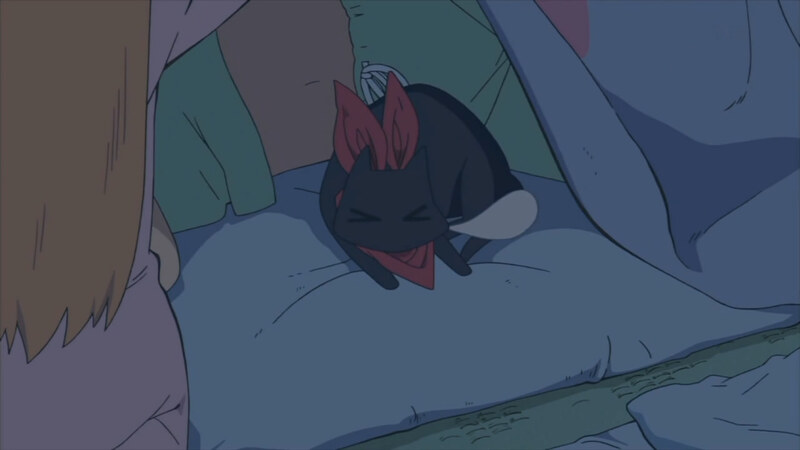 It just wasn't meant to be though; Yukko seemed to have passed out by the end. The next scene was the trip to the market by Nano and Professor. Despite being an 8-year-old child, I really was annoyed by her public meltdown when words didn't work. I guess I just don't have that kind of patience... 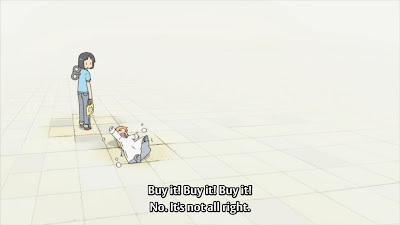 When I found out that Nano had caved and bought the item for Professor, I was quite annoyed. But, by the end of the episode, it had subsided. No one's perfect, and Professor does seem like she's capable of learning and performing good deeds (even if driven by selfish motives). What was the scene with the old man about? (Also, I found out from Rho that the old man is the vice principal. I also learned that I don't pay nearly as much attention to detail as I had previously thought. Dammit.) 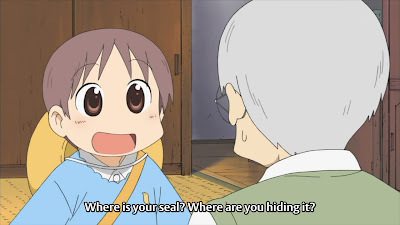 I don't understand what this "seal" is. My hypothesis is that it's some kind of "personal stamp" and the grandchild asking for it signifies that the family wants the man dead to begin transferring wealth over. It only kind of makes sense to me. If someone would explain, that'd be great. Sakamoto is treated so poorly. After a Helvetica Standard (that had another wordplay pun that was a miss with me), the focus returned to Nano-Professor-Sakamoto. In the middle of a particularly terrible storm, Professor fought against all odds to find safety and comfort. It was funny how easily Sakamoto was put out of commission. While I'm surprised that Nano is scared of thunder (she's an android), the pathetic fallacy as Professor asked about the school situation again was nice. 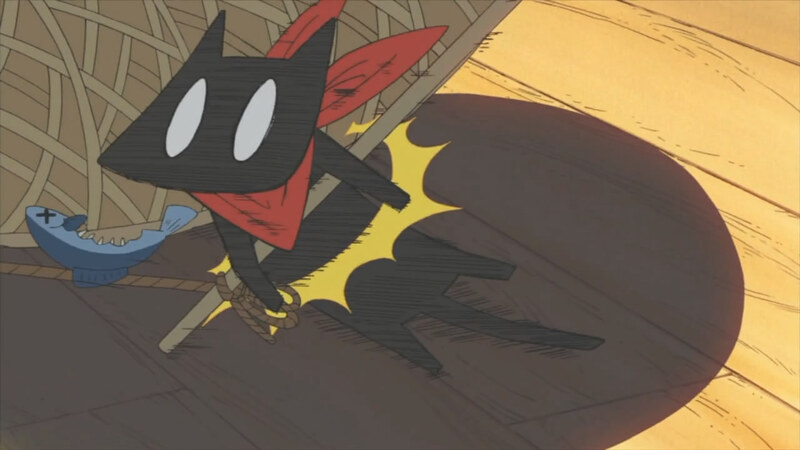 The continuity throughout the episode, filled with shorts and various scenes, was very well done. It was clear that Professor was putting a lot of thought into it. Mai didn't show up at all this episode. 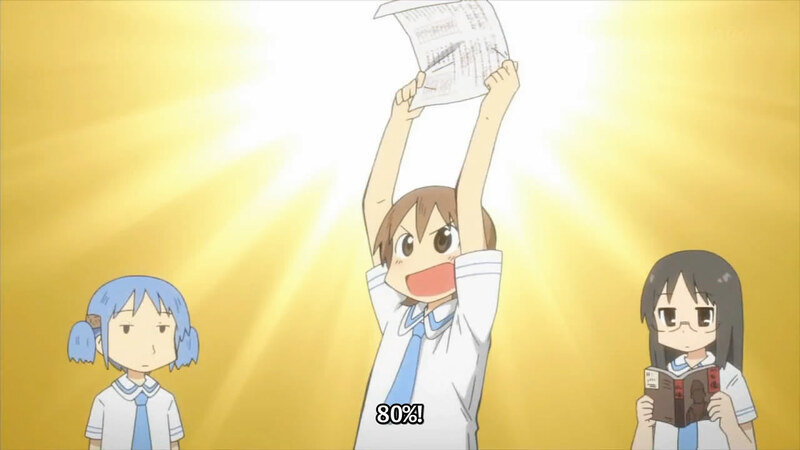 The entire episode had been filled with many shorts pertaining to Yukko's 80% on a recent test. Hilariously enough, both the "A Small Miracle" and "Things You Think Are Cool" shorts were about the 80%. It ended with a final scene of the entire class after the tests had been handed back (and probably reviewed), wherein the teacher announced that the class average had been 92%, making Yukko's mark well below standard. Her immediate depression was quite funny. Am I that evil? Kay. I'm a lot more okay with her now. 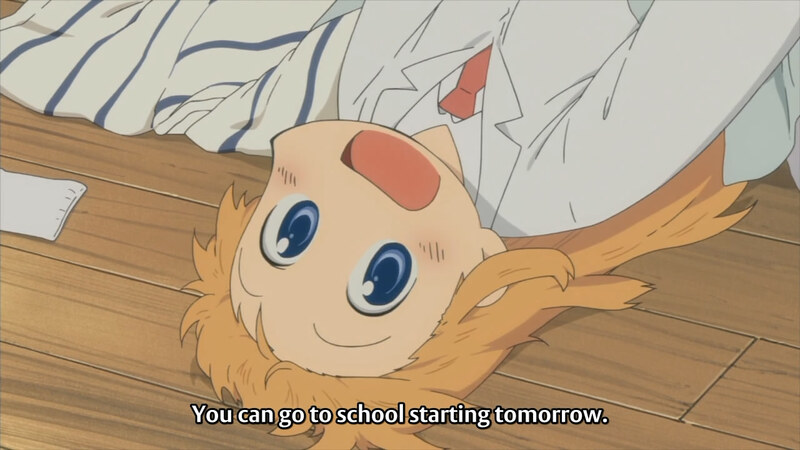 The final scene ended the episode's theme by having Professor announce to Nano that she would be going to school starting the next day. It wasn't 100% a surprise to me, but it really made for an incredibly nice moment. This scene in itself allowed me to stop disliking Professor so much. She's very clearly capable of selflessness. (Of course, her reasoning to have Nano go to school was aided by the fact that she wanted to eat snacks all afternoon without being scolded.) After this moment, I think I'll be able to enjoy this trio's scenes a little bit more. With this episode as either the first of second half or the last of the first half, the plot development was well presented. 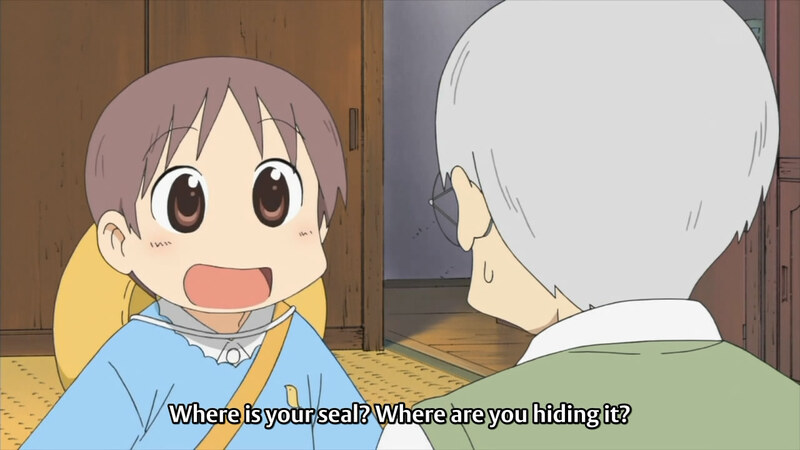 I look forward to seeing Nano at school. I wonder if perhaps her inability to go before had to do more with getting Professor's permission and less with the key, considering it doesn't look like it'll be removed. Either way, this was a very good episode on most fronts and I'm really still enjoying this series.